The Sweet Shoppe & Soda Stop, Monroe GA (CLOSED) – Marie, Let's Eat! I absolutely love small southern downtowns when they’re done right and show off cute local businesses. This past weekend, Marie and the kids and I drove to Athens and took US 78 from Decatur, just to have a different thing or two to look at along the way. I get the impression that 78 used to go through the town of Monroe, but somebody threw some money at Walton County in the early 1980s to build a bypass around the town. Nowadays, travelers have to struggle through sprawling chains and traffic lights to get out of Snellville and Loganville, but go out of the way to find Monroe. Once you get off the four-lane divided highway, you can’t get to the proper town square without driving through more sprawl and Wal-Marts and chains. Honestly, that any business is able to survive in Monroe is pretty impressive. Customers kind of have to go out of their way and past a lot of national businesses to get to the town square. Happily, it’s worth the drive. It’s a very cute little downtown. I had my fingers crossed that we’d find something like an old-fashioned ice cream store downtown to sit down for a snack rather than grabbing something at a Krystal (don’t you judge me), and was not disappointed. It was a pretty slow Saturday afternoon, and this was just what the road trip doctor ordered. 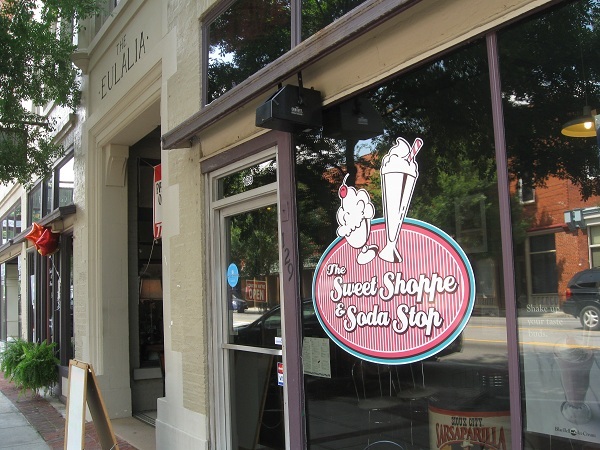 The Sweet Shoppe & Soda Stop serves up Blue Bell ice cream and a host of small-market sodas, including some of our family favorites like Sioux City, Red Rock, Cheerwine and Nehi. They also make their own sodas using Torani syrup. We parked a couple of blocks away and enjoyed a short walk along with our snack. Marie got a grape Nehi and I had my standard black-and-white ice cream soda. Our daughter had a scoop of mint chocolate chip and our son enjoyed a big Cheerwine float. We also took a bottle of Sioux City sarsaparilla home, because you can make two really good floats at home with one bottle of that and four scoops of Breyer’s vanilla. There’s so much to like about little places like this, where you learn a little about the town while enjoying a relaxing treat. On this particular Saturday, we got our drinks for only a dollar each because the shoppe had ordered in anticipation of the monthly “First Friday” concert on the town hall or courthouse steps (I’m not sure which), this time featuring Haywire and the Cat Daddies. Unfortunately, rain canceled the show, leaving the shoppe with an abundance of great beverages chilling in a cooler of slowly melting ice. I love learning about what’s happening in small towns, and I love seeing that most of our money stays in the community that we visit, instead of helping with the corporate payroll at the home office in Saginaw or someplace. I see that the next First Friday will feature the ever-popular South Carolina beach combo the Swingin’ Medallions. We’ll be busy that weekend, even with a fascinating combination pool hall and hot dog stand downtown that just begs further investigation, but if you head that way, have a Red Rock ginger ale or a Bubble Up over vanilla and let me know how it was, okay? Posted on August 12, 2010 July 29, 2017 by Grant G.Posted in athens, dessert, georgia, sodaTagged athens, dessert, georgia, ice cream, monroe, soda.